Facebook is fizzing with fireworks fun this NYE. From Sydney to San Francisco, New Year’s Eve always goes off around the world with the whizzes, pops and bangs of fireworks. This year, Facebook is joining in with a display of its own. Whenever Facebook users post, comment or tap on a New Year’s Eve trigger phrase — “Happy New Year” being the prime example — a fireworks animation will burst across their screen. If your New Year’s resolution is to be more brave and bold, you might also want to take advantage of the dedicated masks available through Facebook Live. You can broadcast your celebrations, reflections and resolutions to all of your followers wearing a pair of 2017 glasses or surrounded by partying emojis. 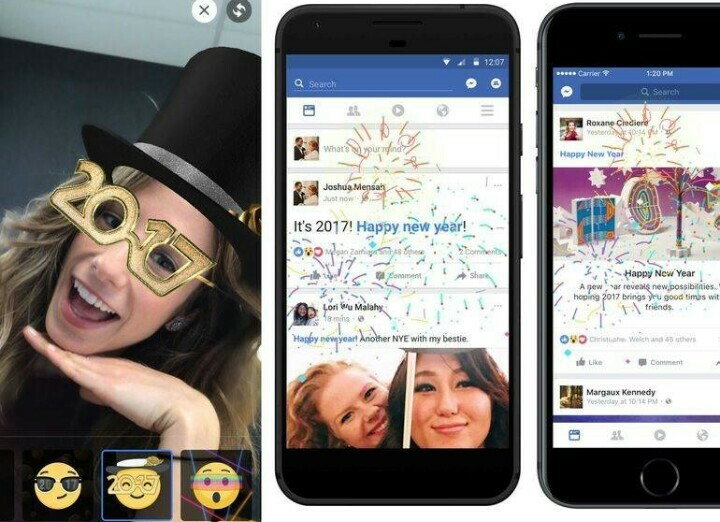 Facebook has increasingly been releasing dedicated holiday stickers, masks and emojis to celebrate special occasions, both to compete with rival social networks like Snapchat and in response to user activity. According to Facebook, users post 70 percent more on New Year’s Eve than at any other time of year. Last year, 182 million used the service to wish friends and loved ones a happy new year and posted 370 million photos and videos, which generated a total of 3 billion interactions. If the same is true this year, a significant number of users will see fireworks exploding across their screens. Fireworks might be new to Facebook, but cast your mind back to the days when the computer user’s procrastination tool of choice was Microsoft’s pre-loaded game Solitaire and you might remember a victory was also marked with celebratory puffs of colorful sparks. It’s a 2017 take on a 1990 old favorite.